Review posted May 29, 2009. Bloomsbury Children's Books, 2008. 307 pages. Tamisin Warner first saw real goblins the Halloween she was eleven. Worse, the goblins noticed that she saw them and came after her. Good thing some sudden lightning bolts scared them away. Seeing goblins isn't the only strange thing about Tamisin. She has pointy ears, and she has a growing compulsion to dance when the moon is full. Her freckles sparkle. She can cover her ears with her hair and the freckles with makeup. She can join the dance group at school. She doesn't want to feel abnormal. But then something happens that she can't ignore. Two beautiful pearlescent wings grow out of her shoulders. And the goblins keep showing up. A new kid at school named Jak seems to see them, too. Not only is Tamisin forced to find out she's not the person she thought she was, she also finds herself a pawn at the center of conflict between fairies and goblins. This fantasy brings readers into an alternate reality where fairies and goblins have their own realm, but the border between them and humans is fragile. 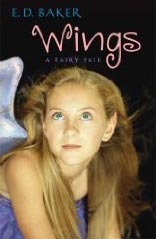 The author's website reports that Wings is the first book of a trilogy, and I'm looking forward to learning more about that world.